"There was once a woman named Christallou and this woman had only a son in this world. Her son was very smart and was very good in letters-not only that, but he was also very handsome and vibrant in life. One day, the Turks came and saw that the boy was [virile] and took him. From that day on his mother cried day and night. -What is the matter and [why are you crying]? -What is the matter? They stole my only son and I don't know where he is. Did they kill him? Is he alive? I don't know what they did with him. -You should not worry and feel sad, Saint Andrew said to her, he is well looked after where he is.You should not cry, and in ten years from now, go to my Monastery at the karpas and you will find him. From that day on, the poor woman stopped crying having taken confort from the words of the saint. A year passed by, and another one...Anyways, in order to make things short, the ten years of waiting came to an end. 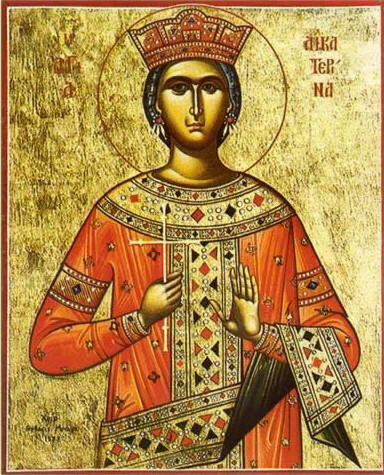 Christallou got ready and took her votive offerings which she dedicated to Saint Andrew and went to his Monastery at the other end of Cyprus. She took holy bread, lit candles, made his comemoration celebration, asked for his prayer, attended the church service, took communion and afterwards went outside the church. She was on guard and was looking around...She saw many foreigners showing up for Saint Andrew's memory celebration. She saw many people comming down from a ship, and among them a Turkish officer, tall, handsome and [virile]. He looked around and his eyes fell on the woman. When he saw her, he recognized her. "She is my mother" he told himself. -Oh my boy, they stole my son, they stole him, they killed him, I do not know what they did with him. However, Saint Andrew told me to come to his Monastery after ten years time, and I would find him. -Will you recognize him after such a long time? -Saint Andrew will help me my boy and I will recognize him. -Does he have any distinctive spot on his body? He asked her. -He has on one of his legs.From the time that he was a baby, while playing near the fire herth, a burning charcoal rolled down and fell on one of his legs. He got burned and had a sore before I had the time to run to him as soon as I heared his cries. I took him to a doctor and he put something on the burned spot which made his pain less, and [slowly], the sore got well. However, the burned spot did not recover. -I also have a burned spot on my leg. He pulled up his clothes, and started weeping. -Oh my son! It is you! -Yes it is me! He said, and they both started crying. Without lossing time, her son went and bought Christian clothes in order to take off the Turkish clothes that he was wearing, and run to the priests and told them his story. -Come and read me a prayer and make a church service for me, so I can wear my Christian clothes because I found my mother. The priests read him a prayer, conducted a church service, and gave him communion. After that he burned his Turkish clothes and put on Greek ones. Can you see now what Saint Andrew can do! We must have faith inside in order that God who is our Master can hear us.Faith and kindness." A Folk Tale from Cyprus based on a true story. Translated from Greek by: Noctoc; taken from: http://noctoc-noctoc.blogspot.com/2008/11/christallou-and-miracle-of-saint-andrew.html. For the life of St. Andrew see: http://full-of-grace-and-truth.blogspot.com/2008/11/st-andrew-first-called-apostle.html. Became a martyr for Christ the Savior. If she would consent to become his wife! And I desire not the love of a corrupt man. Even as the incorrupt spirit seeks immortality. The true man takes care for his immortal soul. Nor worship any but Christ as God. 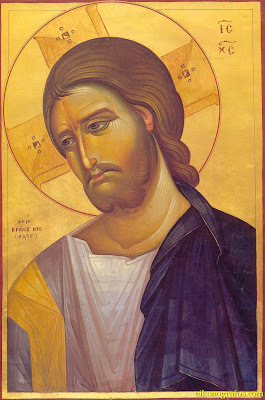 For you dare wage war against Christ, Who is mightier than death. And sing with the angels, in the midst of sweet Paradise. We sing hymns of praise to the chosen and crowned virgin and martyr, the bride of Christ Catherine as the most glorious victor over the tormentor and most wise teacher of philosophers: O holy martyr Catherine, who approaches the Lord with boldness, incline graciously towards the needful petitions of those who call unto you: Rejoice, O Catherine, Most Wise Bride of Christ. Rejoice, O Catherine, Most Wise Bride of Christ. All generations bless you O martyr Catherine. The angels were amazed by your terrible struggles O martyr Catherine. On Mount Sinai, O Catherine, Christ preserves your body. Hail Catherine, the boast of virgins, O beautiful bride of Christ. Rhetoricians and Philosophers you deposed by the presence of the strength of your words. The multitude of the faithful honors, O Catherine, your divine struggle. Grant to those who hymn you release from offenses by your intercessions, O Catherine. Those on Mount Sinai who honor your body, O Catherine protect. O great wonder! How the martyr receives nourishment from heaven. For the life of St. Catherine see: http://full-of-grace-and-truth.blogspot.com/2008/11/st-catherine-great-martyr.html. "The Holy Hieromartyr Peter, Archbishop of Alexandria, was born and raised at Alexandria. He was a highly educated man, and was head of the school of Alexandria. 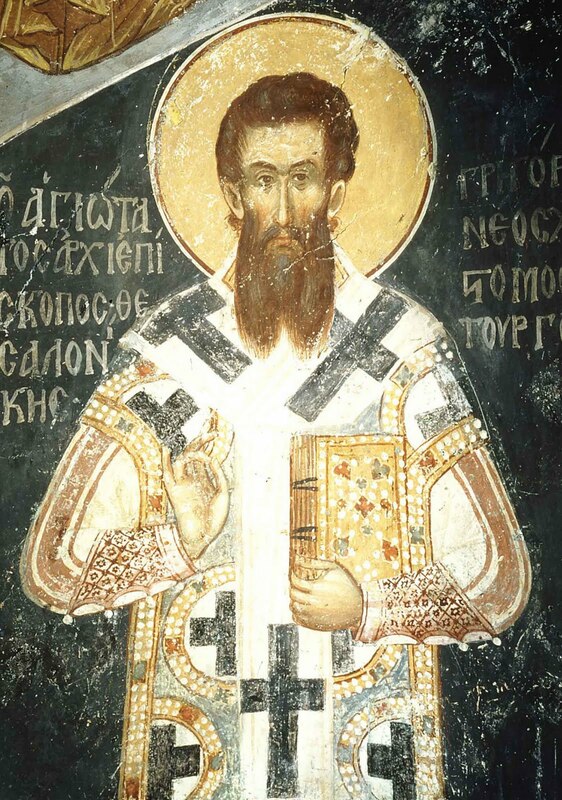 In the year 300 he became the archpastor of the Alexandrian Church, succeeding his teacher and spiritual guide, the holy Bishop Theonas. Forced into exile from the city during the anti-Christian persecutions under the emperors Diocletian and Maximian, St Peter traveled through many lands, encouraging his flock by letter. Again returned to his city, in order to guide the Alexandrian Church personally during this dangerous period. The saint secretly visited Christians locked up in prison, encouraging them to be steadfast in faith, assisting the widows and orphans, preaching the Word of God, constantly praying and officiating at the divine services. And the Lord kept him safe from the hands of the persecutors. During this time of unrest the iniquitous heretic Arius, who denied the divinity of Jesus Christ, sowed the tares of his impious teaching. When Arius refused to be corrected and submit to the truth, St Peter anathematized the heretic and excommunicated him from the Church. 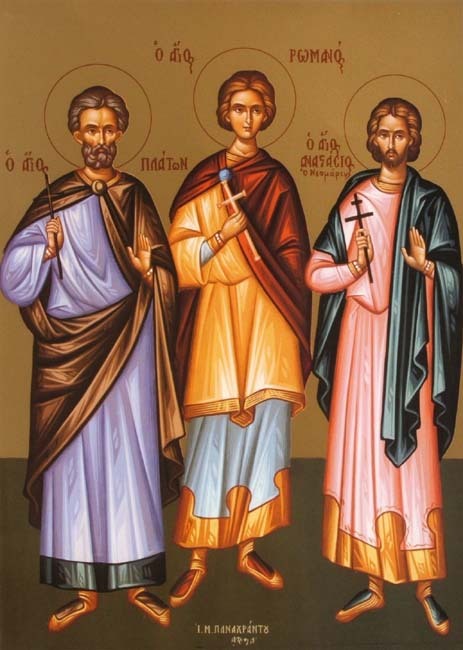 Arius then sent two of St Peter's priests to beg the saint to lift the excommunication from him, pretending that he had repented and given up his false teachings. 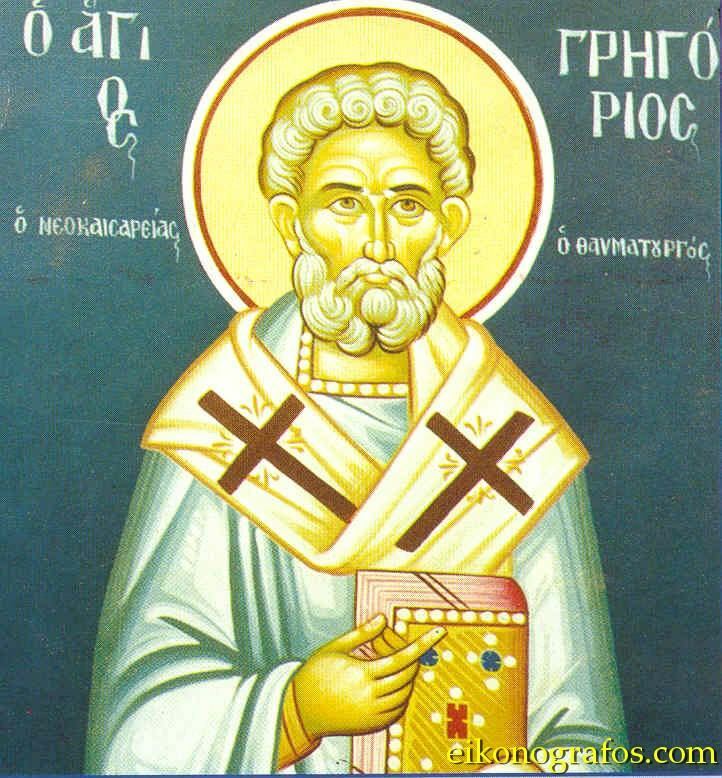 This was not true, for Arius hoped to succeed St Peter as Archbishop of Alexandria. 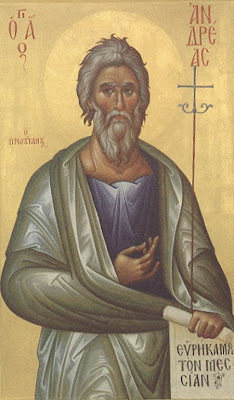 St Peter, under the guidance of the Holy Spirit, saw through the wickedness and deceit of Arius, and so he instructed his flock not to believe Arius nor to accept him into communion. [The Lord Jesus Christ once appeared to St Peter as a twelve-year-old child wearing a robe that was torn from top to bottom. St Peter asked the Savior who had torn his garment, and He replied, "That madman Arius has torn it by dividing the people whom I have redeemed by My blood. Do not receive him into Communion with the Church, for he has worked evil against Me and My flock." Under the wise nurturing of St Peter the Church of Alexandria strengthened and grew in spite of the persecutions. But finally, on orders from the emperor Maximian (305-311), the saint was arrested and sentenced to death. A multitude of people gathered at the entrance of the prison, expressing their outrage. Wanting to avoid bloodshed and a riot by the people, the saint sent a message to the authorities, in which he suggested that they make an opening in the back wall of the prison, so that he might be taken away secretly to execution. In the dark of the night St Peter went with the executioners, who took him beyond the city walls and beheaded him at the same spot where formerly St Mark had been executed. 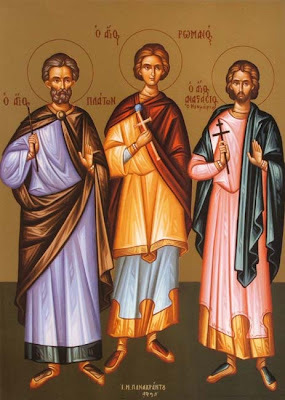 That night a certain pious virgin heard a Voice from heaven saying, "Peter was first among the Apostles; Peter is the last of the Alexandrian Martyrs." This took place in the year 311. In the morning, when people learned of the death of their bishop, a crowd gathered at the place of execution. They took up the body and head of the martyr and went to the church, dressing him in his bishop's vestments, they sat him in his throne at the high place in the altar. During his life St Peter never sat on it, but sat on a footstool instead. The saint once explained that whenever he approached his throne he beheld a heavenly light shining on it, and he sensed the presence of a divine power. Therefore, he didn't dare to sit there. St Peter, a great champion of Orthodoxy, is known also as a profound theologian. 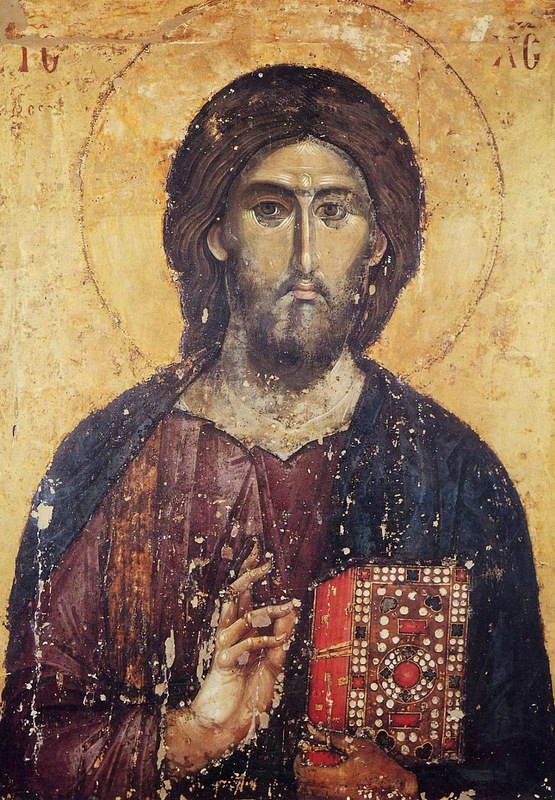 Passages from his book, "On the Divinity (of Jesus Christ)", were consulted at the Councils of Ephesus and Chalcedon. Of all his works, the most widely known and highly esteemed by the Church are his "Penitential Canons"." O divine unshakeable towers of Christ's Church, pillars of true piety who are most mighty and divine: Clement and Peter, ye all-acclaimed, by your entreaties, protect and guard all of us. "If a tree is known by its fruit, and a good tree bears good fruit (Mt. 7:17; Lk. 6:44), then is not the Mother of Goodness Itself, She who bore the Eternal Beauty, incomparably more excellent than every good, whether in this world or the world above? 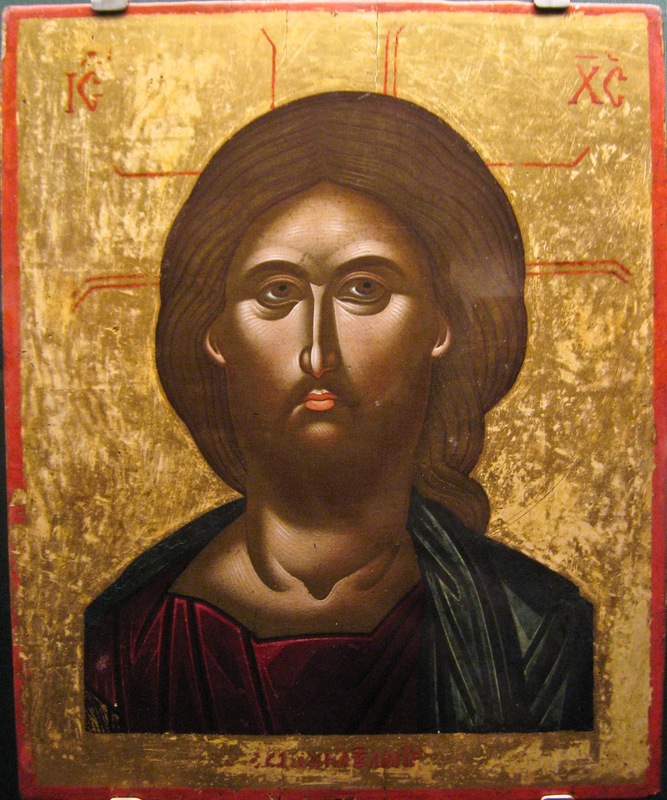 Therefore, the coeternal and identical Image of goodness, Preeternal, transcending all being, He Who is the preexisting and good Word of the Father, moved by His unutterable love for mankind and compassion for us, put on our image, that He might reclaim for Himself our nature which had been dragged down to uttermost Hades, so as to renew this corrupted nature and raise it to the heights of Heaven. For this purpose, He had to assume a flesh that was both new and ours, that He might refashion us from out of ourselves. Now He finds a Handmaiden perfectly suited to these needs, the supplier of Her own unsullied nature, the Ever-Virgin now hymned by us, and Whose miraculous Entrance into the Temple, into the Holy of Holies, we now celebrate. God predestined Her before the ages for the salvation and reclaiming of our kind. She was chosen, not just from the crowd, but from the ranks of the chosen of all ages, renowned for piety and understanding, and for their God-pleasing words and deeds. For another page on the feast of the Entrance of the Theotokos to the Temple, see: http://full-of-grace-and-truth.blogspot.com/2008/11/entrance-of-holy-theotokos-into-temple.html. 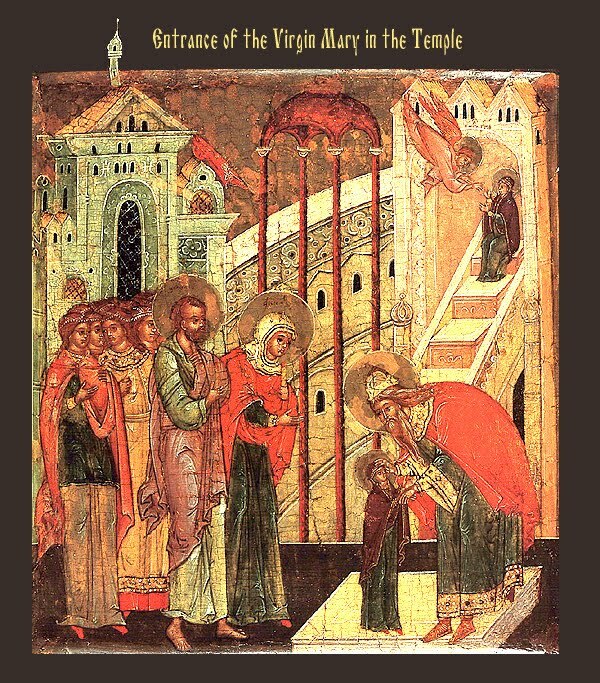 "On the feast day of the Entrance into the Temple of the Most-holy Theotokos, I find it timely to give you instruction in prayer - the main work of the temple. A temple is a place of prayer and arena of prayer's development. For us, entry into the temple is entry into a prayerful spirit. The Lord has the kindness to call our hearts His temple, where we enter mentally and stand before Him, ascending to Him like the fragrant smoke of incense. We are going to study how to attain this state. Gathering in the temple, you pray, of course. And in praying here, you surely ought not abandon prayer at home. Therefore, it would be extraneous to speak to you about our duty to pray, when you already pray. But I do not think that it is extraneous in any way to give you two or three rules about how to pray, if not in the way of teaching, then simply as a reminder. The work of prayer is the first work in Christian life. If in everyday affairs the saying: "live and learn" is true, then so much more it applies to prayer, which never stops and which has no limit. Let me recall a wise custom of the ancient Holy Fathers: when greeting each other, they did not ask about health or anything else, but rather about prayer, saying "How is your prayer?" The activity of prayer was considered by them to a be a sign of the spiritual life, and they called it the breath of the spirit. If the body has breath, it lives; if breathing stops, life comes to an end. So it is with the spirit. If there is prayer, the soul lives; without prayer, there is no spiritual life. However, not every act of prayer is prayer. Standing at home before your icons, or here in church, and venerating them is not yet prayer, but the "equipment" of prayer. Reading prayers either by heart or from a book, or hearing someone else read them is not yet prayer, but only a tool or method for obtaining and awakening prayer. Prayer itself is the piercing of our hearts by pious feelings towards God, one after another – feelings of humility, submission, gratitude, doxology, forgiveness, heart-felt prostration, brokenness, conformity to the will of God, etc. All of our effort should be directed so that during our prayers, these feelings and feelings like them should fill our souls, so that the heart would not be empty when the lips are reading the prayers, or when the ears hear and the body bows in prostrations, but that there would be some qualitative feeling, some striving toward God. When these feelings are present, our praying is prayer, and when they are absent, it is not yet prayer. It seems that nothing should be simpler and more natural for us than prayer and our hearts' striving for God. But in fact it is not always like this for everyone. One must awaken and strengthen a prayerful spirit in oneself, that is one must bring up a prayerful spirit. The first means to this is to read or to hear prayers said. Pray as you should, and you will certainly awaken and strengthen the ascent of your heart to God and you will come into a spirit of prayer. In our prayer books, there are prayers of the Holy Fathers - Ephraim the Syrian, Makarios the Egyptian, Basil the Great, John Chrysostom, and other great men of prayer. Being filled with the spirit of prayer, they were able to up that living spirit into words, and handed it down to us. When one enters into these prayers with attention and effort, then that great and prayerful spirit will in turn enter into him. He will taste the power of prayer. We must pray so that our mind and heart receive the content of the prayers that we read. In this way the act of praying becomes a font of true prayer in us. I will give here three very simple instructions: 1. always begin praying with at least a little preparation; 2. do not pray carelessly, but with attention and feeling; and 3. do not go on to ordinary work immediately after prayer. Even if prayer is common for us, it always demands preparation. What is more common for those who can read and write than reading and writing? However, sitting down to read or write, we do not immediately begin, but we calm ourselves before beginning, at least to the point that we can read or write in a peaceful state. Even more so preparation for the work of prayer is necessary before praying, especially when what we have been doing before praying is of a totally different nature from prayer. 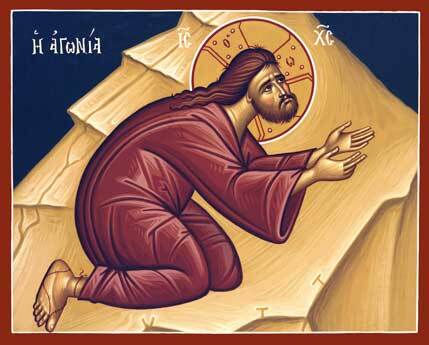 Having stood up in your heart, now stand before your icons, make a few prostrations, and begin with the usual prayers: "Glory to Thee, our God, glory to Thee. O Heavenly King…", and so on. Do not read hurriedly; pay attention to every word and let the meaning of each word enter into your heart. Accompany your words with prostrations. With this effort, the reading of prayers becomes pleasant to God and fruit-bearing. Pay attention to every word, and let the sense of each word enter into your heart; understand what you are reading and feel what you are understanding. No other rules are necessary. These two – understanding and feeling – have the effect of making prayer fitting, and fruitful. For example, you read: "cleanse us from every stain" - feel your stain, desire cleanliness, and ask it from the Lord with hope. You read: "forgive us our debts as we forgive our debtors" - forgive all in your soul, and having forgiven everyone everything in your heart, ask for forgiveness for yourself from the Lord. You read: "Thy will be done" - completely give up your own will to the Lord in your heart, and honestly be prepared to meet everything that the Lord is well-pleased to send to to you with a good heart. If you read each verse of your prayers in this way, then you will be truly praying. In order to facilitate the development of true prayer, take these steps: 1) keep a prayer rule according to the blessing of your spiritual father - not more than you can read unhurriedly on a normal day; 2) before you pray, in your free time become familiar with the prayer in your rule, fully take in each word and feel it, so that you would know in advance what should be in your soul as you read. It will be even better if you learn the prayers by heart. When you do this, then all of your prayers will be easy for you to remember and feel. There is only one final difficulty: your thoughts will always stray to other subjects, therefore: 3) you must struggle to keep your attention focused on the words of your prayer, knowing in advance that your mind will wander. Finally, when you finish your prayers, do not immediately go off to any sort of work, but remain and think at least a little about what you have just finished and what now lies before you. If some feeling was given to you during prayer, keep it after you pray. If you completed your prayer rule in the true spirit of prayer, then you will not wish to quickly go about other work; this is a property of prayer. 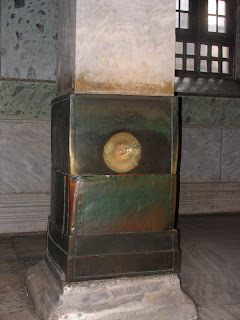 Thus our ancestors said when they returned from Constantinople: "he who has tasted sweet things does not desire bitter things". So it is with each person who has prayed well during his prayers. One should recognize that tasting this sweetness of prayer is the very goal of praying, and if praying leads to a prayerful spirit, then it is exactly through such a tasting. If you will follow these few rules, then you will quickly see the fruit of prayerful labor. And he who fulfills them already without this instruction, of course, is already tasting this fruit. All praying leaves prayer in the soul - continual prayer in this manner gives it root, and patience in this work establishes a prayerful spirit. 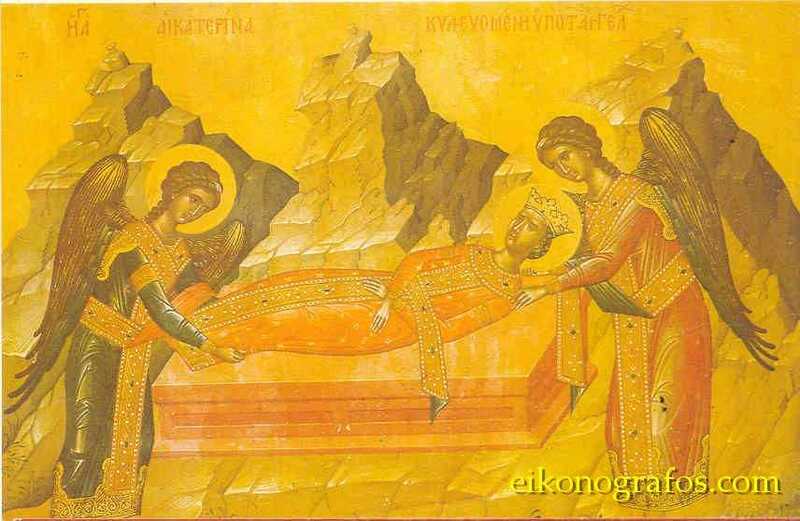 May God grant this to you by the prayers of our All-pure Mistress, the Theotokos! I have given you initial basic instruction in the ways of raising up in yourselves a prayerful spirit, that is, how to pray in a way appropriate to the meaning of prayer - at home in the morning and the evening, and here in the temple. But this is not yet everything. Tomorrow, if God helps, I will teach you a second method. Amen." 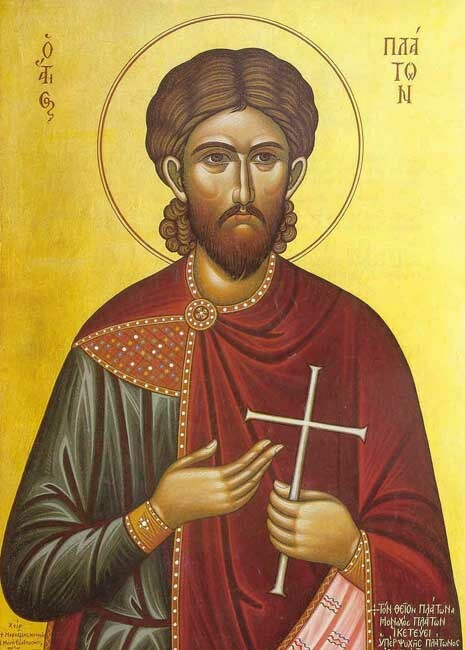 "The Holy Martyr Platon, brother of the holy Martyr Antiochus the Physician (July 16), was born at the city of Ancyra in Galatia. While still a youth he left home and went through the cities, preaching the Word of God to pagans, amazing his audience with the persuasiveness and beauty of his speech, and his profound knowledge of Greek learning. Because of his preaching he was arrested and brought for trial to the temple of Zeus before the governor Agrippinus. At first, the judge attempted to persuade the saint to turn away from Christ by flattery. He assured the youth that he might be on a par of intellect with the greatest of the philosophers Plato, if only he worshipped also the pagan gods. To this St Platon answered, that the wisdom of the philosopher, although great, was but ephemeral and limited, whereas the true, eternal and unbounded wisdom comprised the Gospel teachings. Then the judge promised to give him his beautiful niece for his wife if he would deny Christ. He also threatened him with torture and death if he refused. The patience of the governor was exhausted, and he gave orders to mercilessly beat the martyr, and then send him off to prison. When they led St Platon off to prison, he turned to the people gathered about the temple, and he called on them not to forsake the Christian Faith. Seven days later they again led the Martyr Platon for trial before Agrippinus in the temple of Zeus, where they had the implements of torture already prepared: boiling cauldrons, red-hot iron and sharp hooks. The judge offered the martyr a choice: either to offer sacrifice to the pagan gods, or to feel the effects of these implements of torture on his body. Again the saint steadfastly refused to worship idols, and after his tortures they threw him in prison for eighteen more days without bread or water. Απολυτίκιο. Ήχος α'. Χορός Αγγελικός. Δυάς η ευκλεής, των κλεινών Αθλοφόρων, εδόξασε λαμπρώς, την Αγίαν Τριάδα, ο Πλάτων ο ένδοξος, Ρωμανός τε ο ένθεος, εναθλήσαντες, και τον εχθρόν καθελόντες, όθεν πάντοτε, υπέρ ημών δυσωπούσι, τον μόνον Φιλάνθρωπον. The glorious Dyad, of noble Champions, radiantly glorified, the Holy Trinity, Plato the glorious, Romanos the divine, you struggled, deposing the enemy, therefore ever, entreat on behalf of us, to the only Lover-of-mankind. Thine all-holy memory doth cheer and gladden the whole world, calling all to come to thine august and ven'rable temple; wherein now, with jubilation we have all gathered, and with odes we hymn thy triumphs, O Martyr Plato, and with faith, we cry out to thee: Rescue thy people, O Saint, from barbarous foes. "Anastasius and his sister were Greek peasants living in Epirus under Ottoman rule. One day a band of Turks came through their village, led by Musa, the son of the local Pasha (Governor). Musa was struck by the beauty of Anastasius' sister and tried to seize her, but Anastasius threw himself at the Turks and fought them off long enough for his sister to escape. Musa's father had Anastasius arrested and brought before him and, impressed by his courage, attempted to convert him to Islam by many means: threats, beatings, and offers of worldly honor; but Anastasius held firm and was cast into prison. 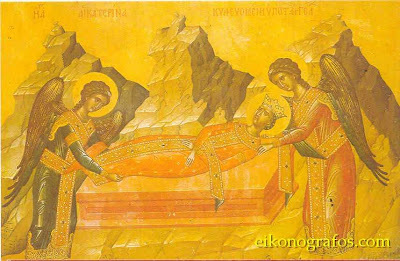 Soon after this, Musa visited the tomb of a holy Martyr and was granted a vision of Anastasius, who appeared to him encircled in light and urged him to continue on the road to Christ. Musa fled his father's domain to the Peleponnese where he received direction in the Faith from an aged ascetic. He then traveled to Venice to be baptized without fear of reprisal by the Turks. 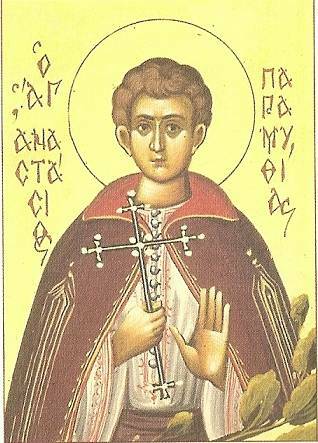 In time he became a monk on Corfu, receiving the monastic name of Daniel. He lived there in asceticism, but the desire grew in him to taste martyrdom for Christ, so he traveled to Constantinople to declare his conversion to the Muslims. But the Christians there dissuaded him, knowing that the conversion of such a prominent Turk would, if it were known, lead to retaliation against Christians. Saint Daniel returned to Corfu, where he founded a church in honor of St Anastasius and reposed in peace." 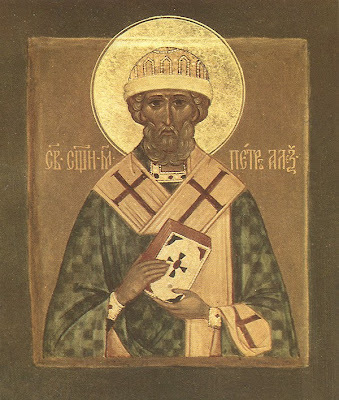 "Saint Gregory the Wonderworker, Bishop of Neocaesarea, was born in the city of Neocaesarea (northern Asia Minor) into a pagan family. Having received a fine education, from his youth he strived for Truth, but the thinkers of antiquity were not able to quench his thirst for knowledge. Truth was revealed to him only in the Holy Gospel, and the youth became a Christian. For the continuation of his studies St Gregory went to Alexandria, known then as a center for pagan and Christian learning. The youth, eager for knowledge, went to the Alexandrian Catechetical School, where the presbyter Origen taught. Origen was a famous teacher, possessing a great strength of mind and profound knowledge. St Gregory became a student of Origen. 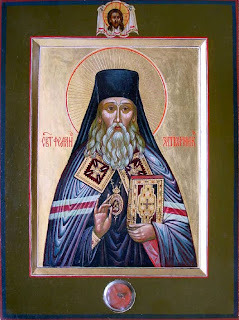 Afterwards, the saint wrote about his mentor: "This man received from God a sublime gift, to be an interpreter of the Word of God for people, to apprehend the Word of God, as God Himself did use it, and to explain it to people, insofar as they were able to understand it." 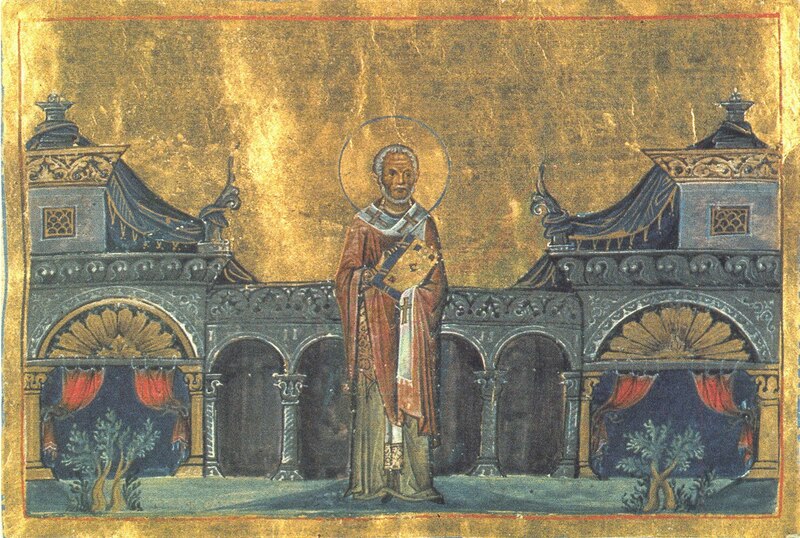 St Gregory studied for eight years with Origen, and was baptized by him. The ascetic life of St Gregory, his continence, purity and lack of covetousness aroused envy among his conceited and sin-loving peers, pagans that they were, and they decided to slander St Gregory. Once, when he was conversing with philosophers and teachers in the city square, a notorious harlot came up to him and demanded payment for the sin he had supposedly committed with her. At first St Gregory gently remonstrated with her, saying that she perhaps mistook him for someone else. But the profligate woman would not be quieted. He then asked a friend to give her the money. Just as the woman took the unjust payment, she immediately fell to the ground in a demonic fit, and the fraud became evident. St Gregory said a prayer over her, and the devil left her. This was the beginning of St Gregory's miracles. Having returned to Neocaesarea, the saint fled from the worldly affairs into which influential townsmen persistently sought to push him. He went into the desert, where by fasting and prayer he attained to high spiritual accomplishment and the gifts of clairvoyance and prophecy. St Gregory loved life in the wilderness and wanted to remain in solitude until the end of his days, but the Lord willed otherwise. The bishop of the Cappadocian city of Amasea, Thedimos, having learned of St Gregory's ascetic life, decided to have him made Bishop of Neocaesarea. But having foreseen in spirit the intent of Bishop Thedimos, the saint hid himself from the messengers of the bishop who were entrusted to find him. 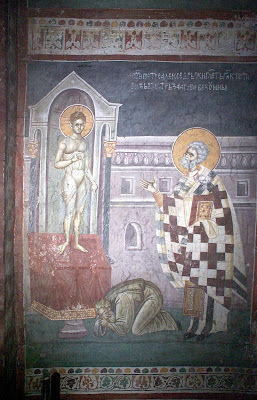 Then Bishop Thedimos ordained the absent saint as Bishop of Neocaesarea, beseeching the Lord that He Himself would sanctify the unusual ordination. St Gregory perceived the extraordinary event as a manifestation of the will of God and he did not dare to protest. 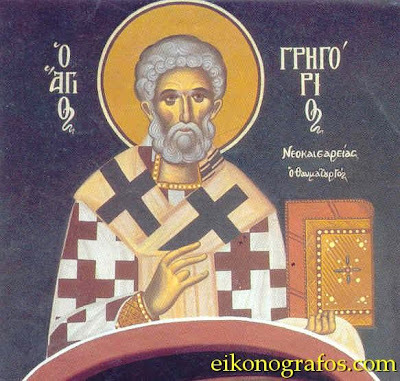 This episode in the life of St Gregory was recorded by St Gregory of Nyssa (January 10). He relates that St Gregory of Neocaesarea received the episcopal dignity only after Bishop Thedimos of Amasea performed all the canonical rites over him. During this time, the heresy of Sabellius and Paul of Samosata began to spread. They taught falsely concerning the Holy Trinity. St Gregory prayed fervently and diligently imploring God and His most pure Mother to reveal to him the true faith. The All-Holy Virgin Mary appeared to him, radiant like the sun, and with Her was the Apostle John the Theologian dressed in archepiscopal vestments. Having become a bishop, St Gregory set off to Neocaesarea. Along the way from Amasea he expelled devils from a pagan temple, the priest of which he converted to Christ. 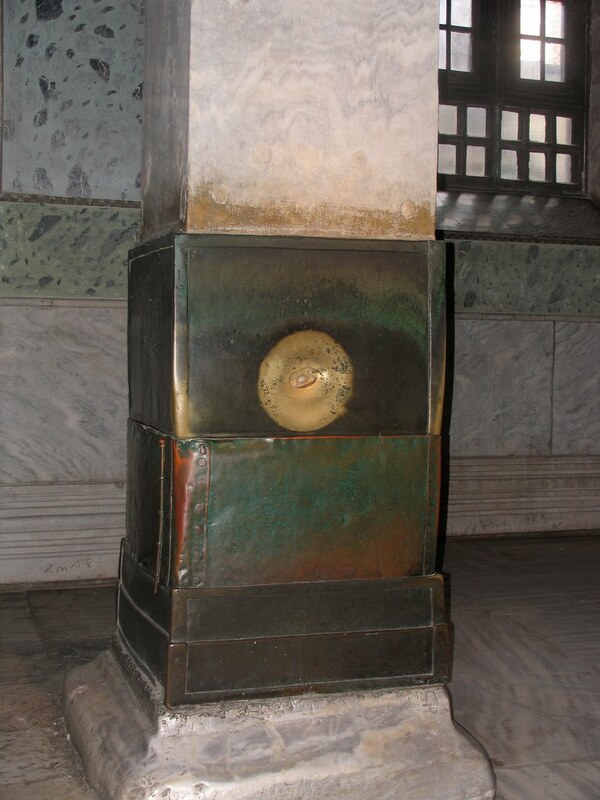 The convert was witness to still another miracle of the saint, at his word a large stone shifted from its place. The preaching of the saint was direct, lively and fruitful. He taught and worked miracles in the name of Christ: he healed the sick, he helped the needy, he settled quarrels and complaints. Two brothers sharing an inheritance were not able to agree over the property of their dead father. There was a large lake over which they argued, for each of the brothers wanted the lake for himself. They both gathered their friends together, and were ready to come to blows. St Gregory persuaded them to delay their fight until the following day, and he himself prayed all night long at the shore of the lake which sparked the quarrel. When dawn broke, everyone saw that the lake had dried up or gone underground. Through the intense prayer of the saint, now there was only a stream, and its course defined the boundary line. Another time, during the construction of a church, he commanded a hill to move and make room at the place of the foundation. When a persecution against Christians began under the emperor Decius (249-251), St Gregory led his flock to a faraway mountain. A certain pagan, knowing about the hiding place of the Christians, informed the persecutors. Soldiers surrounded the mountain. The saint went out into an open place, raised up his hands to heaven and ordered to his deacon to do the same. The soldiers searched the whole mountain, and they went several times right past those praying, but not seeing them, they gave up and went away. In the city they reported that there was nowhere to hide on the mountain: no one was there, and only two trees stood beside each other. The informer was struck with amazement, he repented of his ways and became a fervent Christian. St Gregory returned to Neocaesarea after the end of the persecution. By his blessing church Feasts were established in honor of the martyrs who had suffered for Christ. By his saintly life, his effective preaching, working of miracles and graced guiding of his flock, the saint steadily increased the number of converts to Christ. When St Gregory first ascended his cathedra, there were only seventeen Christians in Neocaesarea. At his death, only seventeen pagans remained in the city." "There is one God, the Father of the living Word, who is His subsistent Wisdom and Power and Eternal Image: perfect Begetter of the perfect Begotten, Father of the only-begotten Son. There is one Lord, Only of the Only, God of God, Image and Likeness of Deity, Efficient Word, Wisdom comprehensive of the constitution of all things, and Power formative of the whole creation, true Son of true Father, Invisible of Invisible, and Incorruptible of Incorruptible, and Immortal of Immortal and Eternal of Eternal. And there is One Holy Spirit, having His subsistence from God, and being made manifest by the Son, to wit to men: Image of the Son, Perfect Image of the Perfect; Life, the Cause of the living; Holy Fount; Sanctity, the Supplier, or Leader, of Sanctification; in whom is manifested God the Father, who is above all and in all, and God the Son, who is through all. There is a perfect Trinity, in glory and eternity and sovereignty, neither divided nor estranged. Wherefore there is nothing either created or in servitude in the Trinity; nor anything superinduced, as if at some former period it was non-existent, and at some later period it was introduced. And thus neither was the Son ever wanting to the Father, nor the Spirit to the Son; but without variation and without change, the same Trinity abideth ever." 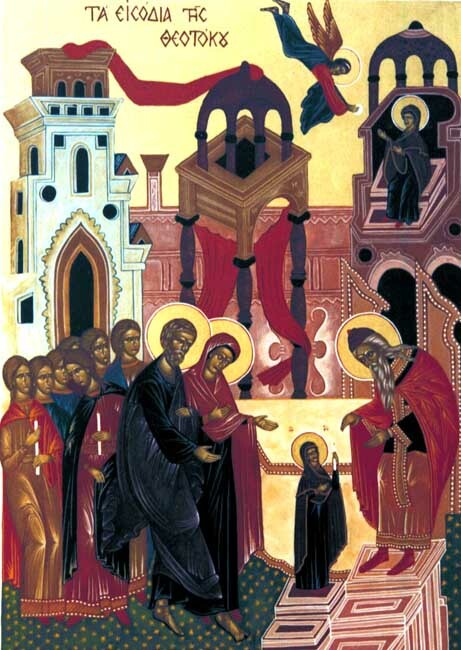 I beliebe the following document has three homilies of St. Gregory on the Annunciation, and one homily on Theophany: http://www.documentacatholicaomnia.eu/03d/0213-0270,_Gregorius_Thaumaturgus,_Four_Homilies_[Schaff],_EN.pdf, while this site has others: http://www.documentacatholicaomnia.eu/30_20_0213-0270-_Gregorius_Thaumaturgus.html. 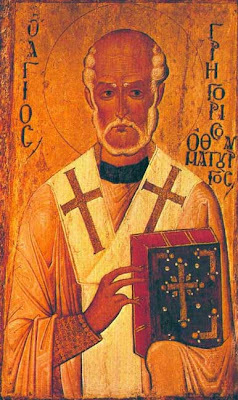 May St. Gregory the Wonderworker intercede for us and help us! By vigilance in prayer, and continuance in the working of wonders, thou didst acquire thine achievements as a surname; wherefore, intercede with Christ our God, O Father Gregory, to enlighten our souls, lest we sleep in sin unto death. Since thou hadst received the power to work miracles, thou dravest from men diseases, O wise Gregory, and with fearful signs thou madest the demons tremble; hence, thou art called Wonderworker, O man of God; for thou hast received thy surname from thy works. 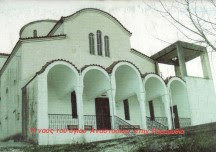 ἦλθον γὰρ διακονῆσαι, οὐ διακονηθῆναι. μόνον οἰκείως ἔχε πρὸς ἐμέ. κάτω ὑπὲρ σοῦ πρεσβευτὴς παραγέγονα παρὰ τοῦ Πατρός.